Your kitchen floor tile is picked out, as well as your counter tops. Cabinets? Yup, all picked and designed. What’s next? Is there anything else that we are forgetting in this kitchen remodel? Could it be the back splash? WHAT ARE WE GOING TO DO?!?!? Thanks in a big part to HGTV most folks are going bonkers over trying to find the perfect back splash for their kitchen. Stressing day after day over that perfect piece of “bling” that will make or break their back splash. Wondering what their friends and neighbors will say when they walk into their kitchen…Will it be a “WOW!” or an “ow…”? Relax, we are here to help you with this area. A back splash isn’t the focal point of your kitchen, it is what ties the kitchen together. A good back splash should make your counter tops and cabinets stand out, because that is what people actually notice in your kitchen. Your kitchen is a gathering place for friends and family and the overall picture of the room is what is going to make it or break it, not that one piece of shiny “bling” or how that one .5cm spot of blue got picked up from the glass during the midday sun. Don’t get me wrong, I want your back splash to be awesome and bring your kitchen together to make it amazing. And the folks here at Universal Tile can, and will, help you get just that…a “WOW!” kitchen. There are a few things to remember about picking out your back splash. 1. Make sure you have selected your counter tops and cabinets before you go shopping for back splash. As it has been described to me before, shopping for back splash tile before the counter tops and cabinets are selected is like shopping for the shoes before the dress. 2. Your back splash is the last part of your kitchen to be installed. What this means is the rest of your kitchen needs to be installed (floors, counter tops, & cabinets) before you can install your back splash. So, no need to rush on it. Wait until you have all the pieces first. 3. When you come to select tile, have a sample of your counter and your cabinets. Why do we suggest this? How are you going to pick out those shoes if you don’t have the dress to compare them to? Basing selections off of your memory will give you nothing but headaches. Make sure you have something to compare with so we can help do a mock up for you before you decide 100% on what to buy. 4. 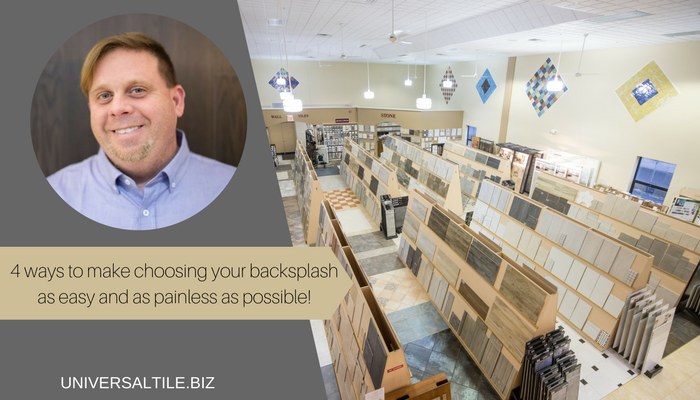 Listen to your sales rep when shopping for back splash tile. We are here for you and back splashing is a regular thing for us. Bring your thoughts and ideas with you so we can get an idea of what you are looking for. Then sit back and enjoy the ride towards that finishing touch of your kitchen. Universal Tile has a huge selection of tiles for your back splash and we want to help you select it and make it happen. Back splashing is not a difficult task if you follow the steps above and let it all come together. We look forward to seeing you soon.